The following is an overview of human rights violations in Iran on December 20th, 2018 based on the information compiled and verified by Human Rights Activists News Agency (HRANA). (1) Ebrahim Nouri, an Azerbaijani Turkic minority rights activist filed a complaint against the head and the judicial deputy of Evin prison. Nouri, a law student, has a record of being detained for civic activities, beginning in 2005 when he was arrested and interrogated by the Intelligence department. In 2009, he was sentenced to ten months imprisonment on a charge of propaganda against the regime. (2) Five of the significant spate of Nationwide protests today: retired educators in Gilan, Isfahan, Yazd, and Zanjan have held protests. And shareholders of the bankrupt Caspian Financial Institution protested in Kerman. (3) A furlough request of Latif Hassani, a Azerbaijani Turkic minority rights activist, was denied. He was arrested in 2012 and has been sentenced to eight years imprisonment. He was accused of forming an illegal group to act against the national security. (4) More than 2600 workers of Railway Transportation Company and Samen al-Hojaj financial Institution are demanding their unpaid wages. The issue of unpaid wages has been a continuous one in Iran over the last year. (5) Mahmoud Naji who began his hunger strike on December 11, has critical medical states and he has been denied medical treatment. He is serving his 10 years sentence in Evin prison. (6) Two labor activists, Mehrdad Sabouri and Omid Ahmadi, who were accused of “propaganda against the state” for participating in international Labor day protest, began serving their sentence today. (7) Afif Naimi, one of the administrative members of the Baha’i Community who was arrested in 2008, and served his 10 years sentence was released today. He was accused of ‘assembly and collusion’, ‘blasphemy’, and ‘propaganda against the State’. (8) Omid Shahmohammadi, a teachers’ rights activist who had been arrested on November 12, was released on bail in Divandarreh today. (9) On December 20, police opened fire on a fuel tanker truck in Zahedan which caused the truck to set on fire. (10) Eight prisoner requested human rights organisations especially the Special Rapporteur on Human Rights in Iran to investigate in Vahid Sayadi Nasiri ‘s death. Earlier this week France and US requested investigation on the circumstances of his death. (11) A juvenile offender death penalty was confirmed in the Supreme Court. He was charged with murder in 2011 when he was 14 years old. (12) Bahram Javadi, the administrator of ‘YollPress’ website, was released on bail today. He was arrested on a complaint from the governor of West Azerbaijan regarding coverage his speech coverage. The following is an overview of human rights violations in Iran on December 13th, 2018 based on the information compiled and verified by Human Rights Activists News Agency (HRANA). Today at least nine protests were held in Iran and the protesters demanded the fulfilment of their requests. Members of the Azadegan housing corporation project, the land owners by Kohestan park in Yazd, the workers of sanitizing oil tankers company in Bandar-e Emam Khomeyni, Hendijan’s launch owners, shareholders of the bankrupt institution of Caspian, Isfahan farmers, and the clients of Ramak Khodro and Negin Khodro companies held an assembly protest on December 13, 2018. Moreover,On the 33th consecutive day of protest, the workers from the Iran National Steel Industrial Group (INSIG) in Ahvaz, accompanied by their families, have held a protest in Ahvaz streets. They were wearing white shrouds which is a symbol of readiness for martyrdom. In addition, teachers and students in Hamedan protested the approach of Islamic Republic of Iran Broadcasting (IRIB) to teachers. They requested IRIB to depict financial hardship of teachers and they were also in support of the release of teachers’ right activists who have been imprisoned. Mahmoud Naji, charged with security offences, began a hunger strike on December 12, 2018 to protest his accusations and not receiving any response on his temporary release request.Ruhollah Mardani, a teacher prisoner, went on strike since December 9, 2018 toprotest the situation of prison and the poor access to health care in prison. Zaniyar Dabbaghian, a labor activist released on bail from Sanandaj prison on December 12. He was arrested on October 8, 2018 in his house for an unknown reason. He had been detained for 67 days and release on 300 million Tomans  bail. The followers of Ansar Al-Mahdi, a religious group of Ahmad al-Hassan were arrested in Torbat-e Heydarieh in August 2018. The conviction of 60 detained people of this group including a child, announced on December 9. Overall, they faced 82 years and six months imprisonment, 4318 lashes and 13 years of exile and fines. The workers of North Drilling Company protested for their unpaid wages last week. On December 13th, they reported that the wages of 3000 workers of this company were still unpaid.Moreover, the spokesperson of fire department confirmed that a construction worker was severely injured in the construction site in Zafaraniyeh. On August 29, 2018, afteran attacked from the prison guards, these eight Gonabadi Dervishes are Reza Entesari, Kasra Nouri, Morteza Kangarloo, Amir Nouri, Sina Entesari, Mohammad Sharifi Moghaddam, Hesam Moeini, and Mehdi Eskandari were beaten, separated from other Dervishes, and sent to solitary confinements for their three-months trike at Fashafoyeh prison without informing their family. Three park rangers were injured by poachers in Tarom Sofla district in the Qazvin province. A citizen was saved from execution in Nowshahr by the help of judicial authorities and victims families’ consent. 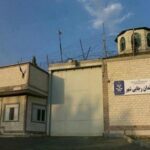 HRANA News Agency – On June 14, Mahmoud Naji, security prisoner in ward 2 (Daralqran) of Rajai Shahr prison in Karaj in the wake of refusing to go to the court due to considering the Court of Justice as “unfair”, was transferred to a military court while being beaten and the guards broke his right arm.